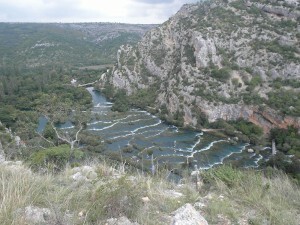 The trip to Krka National Park, approximately 30 km away from Vodice, takes about 40 minutes. Entries to the park are at Skradin and Lozovac. At the spot you will have an opportunity to travel with tourist boats to see the first part of the park. 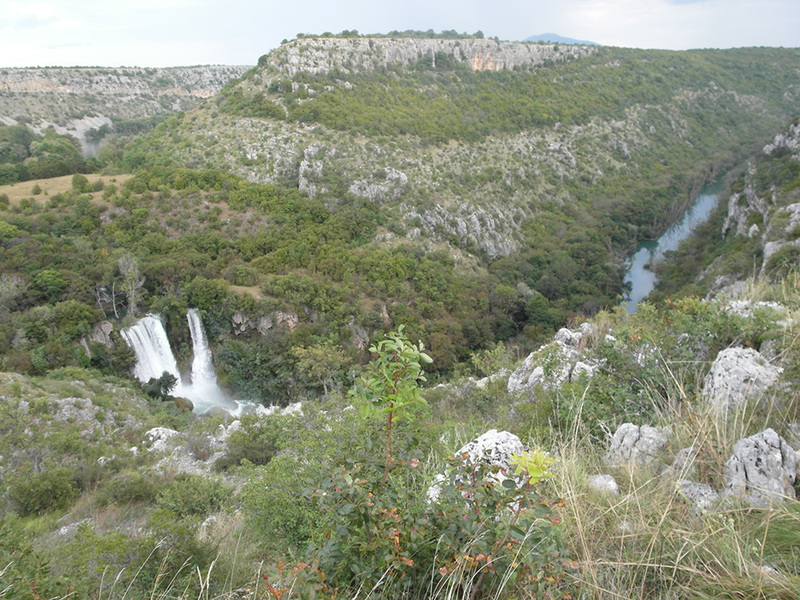 Lower area of the national park offer breathtaking views of waterfalls and beautiful nature. 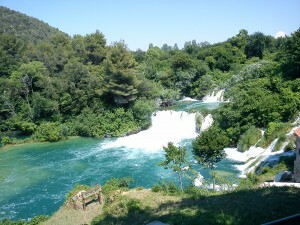 The waterfalls on Krka, next to Plitvickie National Park, are one of the most beautiful areas of Croatia. Should You have time for further sighseeing, I highly recommend taking a boat trip from Lozovac to Visovac – a tiny Island in the middle of the lake with a Franciscan monastery. 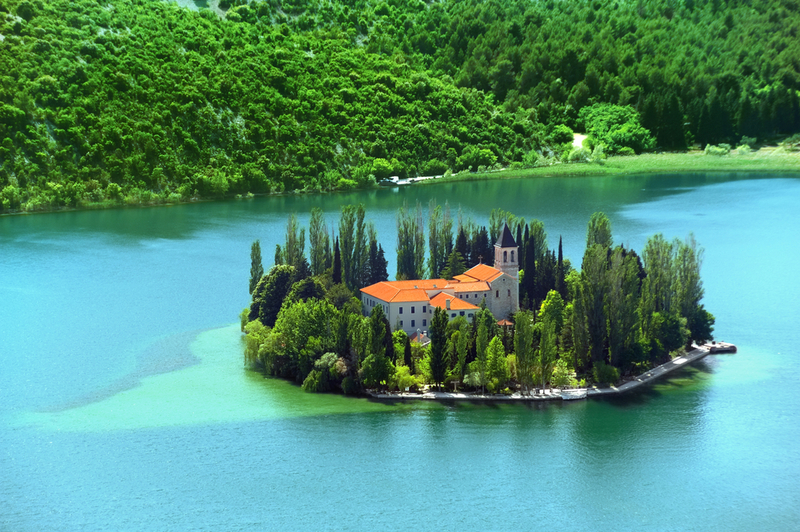 The photos of the monastery on Visovac are often seen on postcards from Croatia, as it is one of the most remarkable places in the National Park. If You want to see the monastery from above, there is a great viewing spot near the town of Bristane – just turn left on the roundabout before the town. It is also possible to take a boat from the parking there to visit the monastery. The history of the building dates back to XV century. The museum is open at the monastery with archeological items and a collection of art and books. Another interesting area to view in the national park is its upper part. I advise going first to Roski Slap entry, just above the town of Rupe. This area also offers extraordinary views of waterfalls, surrounded by tall rock walls of the valley. There is a car parking at the entrance. In the area, there is also a cave, high above ground, which can be visited. There is a long wooden staircase leading to the cave. Further on up the valley, there is another monastery open for visit. It is remarkably beautiful and certainly worth visiting. The Krka Monastery is Serbian Orthodox, the paintings on the walls of the church situated here are really worth seeing. Should you still have some time to travel up the Krka river after this visit, it is also a good idea to see the fortressess of Trosenj and Neceven. The last part of the park, I highly recommend visiting is around the Brljan lake with the tallest waterfall called Manojlovac. The view of the valley here is so beautiful, that even the Austrian emperor Franz Jospeh I made a stop here to admire the view. The area near the lake, called Burnum contains some interesting archeological elements of a Roman camp and arena.